Mon-Sat Elmers End (ED) allocation added. Sunday Elmers End (ED) allocation added. Mon-Sat Elmers End (ED) allocation withdrawn. Sunday withdrawn between Woolwich and Plumstead Common. Elmers End (ED) allocation withdrawn. Woolwich to Woolwich Industrial Estate vis Plumstead Road - Griffin Manor Way - Nathan Way - and Purland Road. Selsdon to Riddlesdown via Addington Road - Rectory Park and Mitchley Avenue. Timetable bus note that and one pm journey ran the whole length of the route from Woolwich Industrial Estate to Riddlesdown - a journey time of approximately 1 hour 45 minutes. This photo of RT2812 (TL) was taken during the 1968 period of closure of Long Lane for the reconstruction of of the bridge over the Hayes railway line just to the west of Elmers End and the 54, along with the 725, were diverted from Ashburton up to Norwood Junction, then via The Goat House, Croydon Road, and Elmers End Road. Both routes ran non-stop over the diversion. Sundays diverted at East Croydon to West Croydon instead of Selsdon. Daily Elmers End (ED) allocation added to partly compensate for a lot of Route 12 duties being lost. 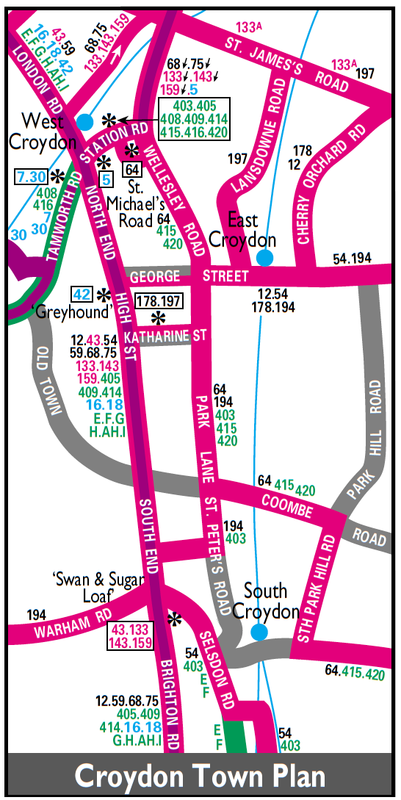 Mon-Fri withdrawn between Croydon and Selsdon/Riddlesdown - replaced by alterations to Route 12A. Sunday Routemasters introduced - spare from Route 12. Sunday converted to |One Person Operation. Catford allocation converted from Daimler to Leyland Titan operation. Rerouted in Croydon to terminate at West Croydon Bus Station at all times. 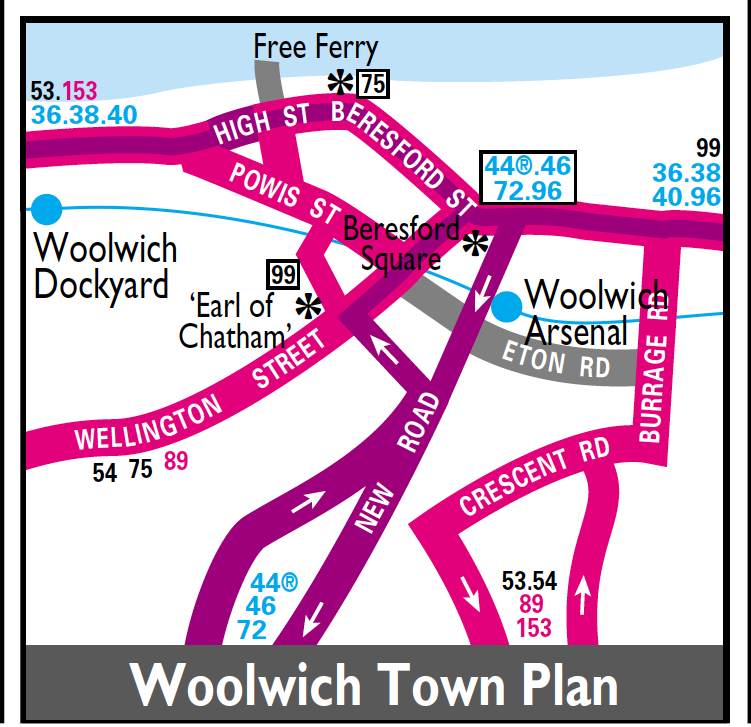 Saturday shopping hours extended from Woolwich to CHARLTON Asda via Greens end - General Gordon Place - Vincent Road - Burrage Road - Plumstead Road - Beresford Street - Market Hill - Woolwich High Street - Woolwich Church Street - Woolwich Road - Gallions Road - and Bugsbys Way. 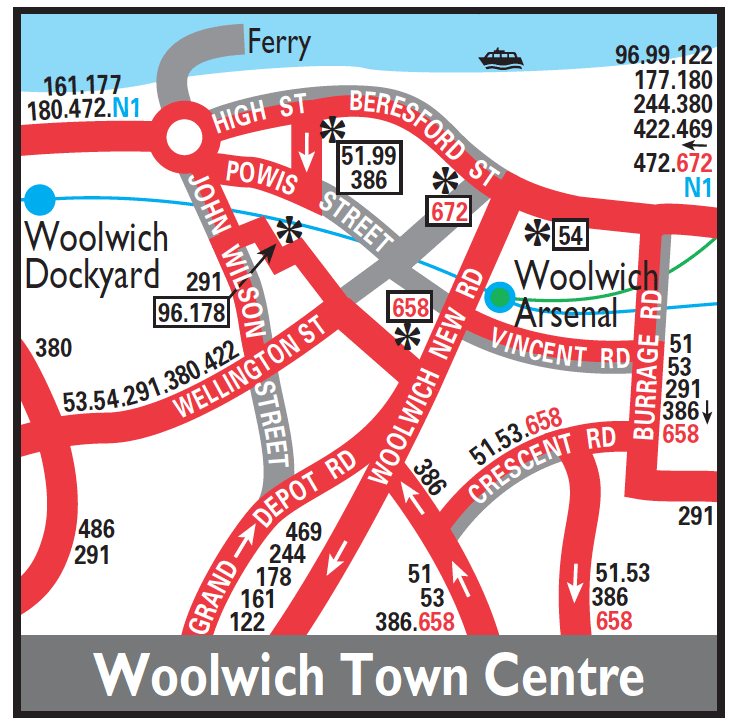 Sunday garage journeys extended from Woolwich to PD Garage. Sunday only Plumstead allocation added - Catford allocation withdrawn on this day. Sunday converted to midibus operation - and Catford allocation re-introduced on this day. Plumstead (PD) operation now daily. Mon-Sat PD allocation transferred to TL but Sunday TL allocation transferred to PD. Sunday Route reverted to big bus operation. Converted from Leyland Olympian to Volvo operation. Daily PD allocation transferred to TL. Withdrawn between Elmers End and West Croydon as part of the new tram scheme in Croydon. 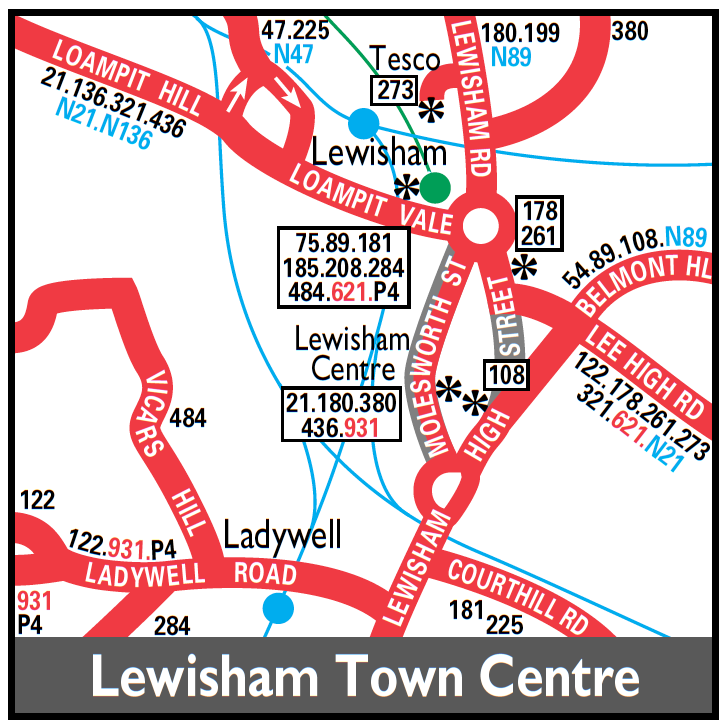 Plumstead allocation withdrawn - to make room for new Route 453. Changeover point at Elmers End Green.